Individual License (for installation on a single computer for use by one individual at any time). *Available in Download, CD-ROM, and Subscriptions. 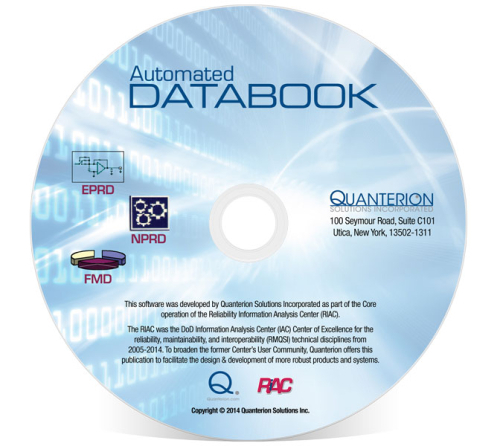 *NOTE: Please contact Quanterion at (877) 808-0097 (Toll Free), or (315) 732-0097 if you are a 3rd party software tool developer and would like to inquire about incorporating this data into your product. *NOTE: The CD-ROM or download versions are not PDF versions of the Hardcopy document. This document contains reliability data on both commercial and military electronic components for use in reliability analyses. It contains failure rate data on integrated circuits, discrete semiconductors (diodes, transistors, optoelectronic devices), resistors, capacitors, and inductors/transformers, all of which were obtained from the field usage of electronic components. At 2,716 pages, the format of this document is the same as RIAC’s popular NPRD document which contains reliability data on nonelectronic component and electronic assembly types. Nonelectronic Parts Reliability Data (NPRD) provides failure rate data for a wide variety of component types including mechanical, electromechanical, and electronic assemblies. It provides summary and detailed data sorted by part type, quality level, environment and data source. The data contained in this database represents a compilation of field experience in military, commercial, and industrial applications, and concentrates on items not covered by MIL-HDBK-217, “Reliability Prediction of Electronic Equipment.” Data includes part descriptions, quality level, application environments, point estimates of failure rate, data sources, number of failures, total operating hours, miles, or cycles, and detailed part characteristics. The “Failure Mode/Mechanism Distributions – 2016” (FMD-2016) publication is the fourth in a series that covers Failure Mode and Mechanism Distributions on electronic, electromechanical and mechanical parts and assemblies. It supersedes “Failure Mode/Mechanism Distributions – 2013” and provides a cumulative compendium of failure mode/mechanism data. The intent of this publication is to present failure distributions on parts and assemblies to be used in support of reliability analyses such as FMEAs and FMECAs. Data contained in this book can be used to apportion an item’s failure rate into modal elements by multiplying the failure rate by the percentage attributable to specific failure modes. These distributions provide a baseline set of probabilities to be used in the reliability engineering industry. This document complements the Quanterion publication “Expanded Applications of FMECA”, which provides guidance on performing FMECAs. * NOTE: The CD-ROM or download versions are not PDF versions of the hardcopy. * NOTE: The CD-ROM or download versions are a Windows compatible database software tool. The tool operates in the Windows XP, Vista, 7, 8, 8.1 and 10 environments.